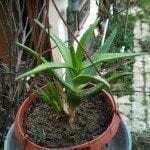 Hello, I have a couple of Aloe plants that were in great health a couple of months ago. I haven\'t changed anything, but now they seem to be losing their plumpness, it\'s like the aloe is disappearing in the leaves. They are still green and healthy. I water every week-two weeks. The very tips of the plant are starting to turn a faint brown. I read about under watering and over watering but I don\'t know which one I might be doing. I couldn\'t find anything online about the leaves losing their plumpness and internal aloe vera.